As it had been said for decades “prevention is better than cure”, surely there are ways we can prevent suffering from conditions related to repetitive stress injury rather than waiting for it to happen then going for the cure. 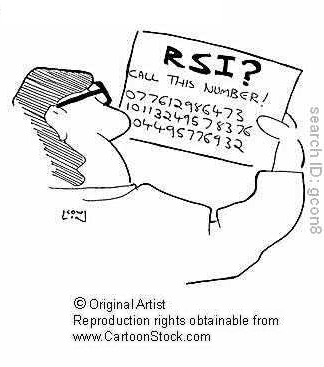 RSI is defined as having muscles, tendons or joint tissues experience stress by means of movements or actions that is being done in repeated ways. Of course we can not do away from those things especially when it is by nature included in completing a work-related task, but there are ways to prevent it. Sit up straight. Slouching can be one of the primary risk factors in developing repetitive stress injury. 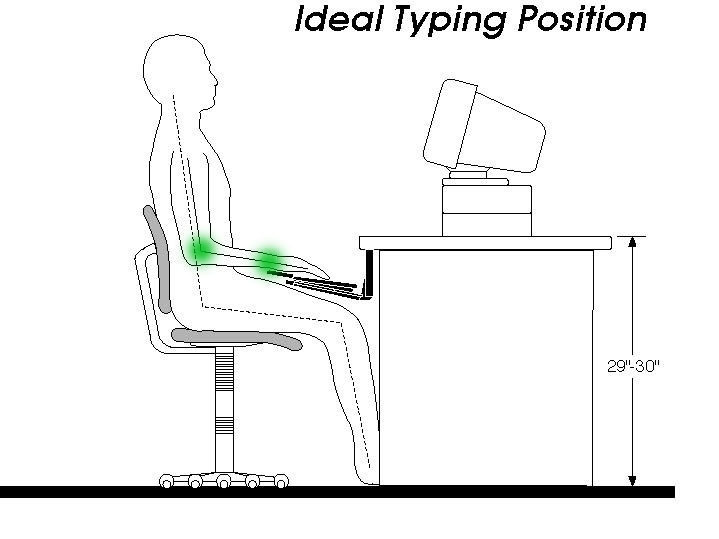 Adjusting your seat is one way to gain proper positioning, straight back and not leaning forward over the keyboard. 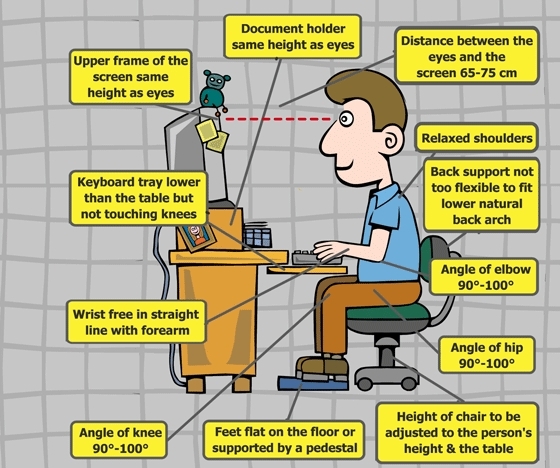 Adjust your monitor by placing it directly facing you and the top of its screen should be in an eye level height. Type right. Let your fingers in a neutral position when you type, not bending your pinky finger nor bending towards your thumb and also take note not to bend your wrist upward towards you. This is known as DORSIFLEXION. Click right. Most people develop RSI on their hand cause of the improper position when using the mouse. Again, dorsiflexion is most to blame. It is best to use a gel pad or a mouse bean for better support of the wrist while clicking away. Just like in the use of keyboard, click in a neutral position. Stand up from that seat and stretch! Have at least 5 minutes to rest those muscles and joints every after a 20-30 minute working time. This might be difficult to follow specially when you are meeting a deadline, but it is a must. Stretching your muscles or taking short walks during breaks gives you the opportunity of movement. When you move, you contract and relax muscles which enhance blood circulation for a better oxygenation in the body. Better oxygenation, better brain functioning and most importantly a great way of relieving stress. If you want to cheat on taking a break from work, carry some work papers or take a glass of water or coffee back with you, that way, your co-workers will think you’ve been busy for the last five minutes that you have been away from your work desk. It is a smart idea thus having all the advantages you can get, first the break you’ve needed to decrease your chance of over stressing your tendons and muscles, second, the idea of having your co-workers think you are a hard working person and might also be a way for them to recommend you for promotion. Pretty sneaky, right? But it works most the time. Eat your vegetables not just meat. Not tasty as it may sound, vegetables are good for you. Listen to mom! Why? Because vegetables are great sources of vitamins and anti oxidants that help in destruction of free radicals that causes certain cancers. Vegetables are also rich in fibers to help prevent constipation, thus helping you maintain proper weight and avoiding obesity. The denser the person gets, the higher his risk for putting more pressure over a joint while working which may lead to repetitive stress injury. Follow these three simple tips and surely you will decrease your risk for developing repetitive stress injury.